The staff at the Hepburn Veterinary Clinic are dedicated to helping you care for your animals! The clinic provides a number of services for both large and small animals and stocks a wide range of animal care products. The friendly staff are always happy to answer any questions, offer professional advice, or just have a quick chat. 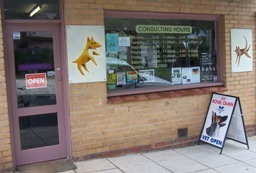 So drop in and see what the clinic has to offer, both for you and your animals. Nikki 'The Clinic Cat' was rescued by Emma years ago and following the sad passing of Claude (our previous clinic cat) Emma decided to bring Nikki in to the clinic, where, without any prompting, she soon took over Claude's old position on the front counter. Sophie and Owen are Emma's dogs and are lucky enough to come to work with her. They are utlised within the clinic as blood donors if required and provide a calm, stable influence. They also act as union representatives for any canine patients!